Featuring the voices of Elijah Wood, Robin Williams, Brittany Murphy, Hugh Jackman, Nicole Kidman, Hugo Weaving, Anthony LaPaglia, E.G. Daily, Steve Irwin, Johnny A. Sanchez, Carlos Alazraqui, Lombardo Boyar, Jeff Garcia, Fat Joe, Chrissie Hynde, Roger Rose, Peter Carroll and Larry Moss. Screenplay by George Miller, John Collee, Judy Morris and Warren Coleman. Distributed by Warner Brothers Pictures. 128 minutes. Rated PG. 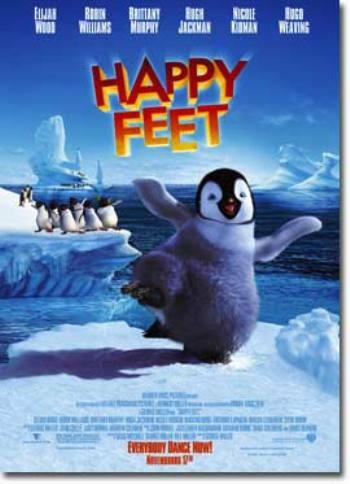 Sort of like The March of the Penguins without the actual penguins, but with added music and cute humor; Happy Feet is a charming if slightly inconsequential kids flick. This computer animated tale seems made by committee to be a kiddie smash — it has cute penguins, an easy-to-take moral about being yourself and a sound ecological message (which frankly, feels a tiny bit tacked on, like halfway through the movie they saw An Inconvenient Truth and decided they should address these ideas, too). It is the story of Mumble, a baby penguin who through some freak can’t sing like all other penguins, but he can do an old soft-shoe like Savion Glover. (In fact the dances for the penquin were designed by Glover, unfortunately they necessarily lose a little oomph just due to the penguin’s extremely short legs.) This difference in artistic pursuits makes him odd and a pariah in his community — and if you’re an outcast as a penguin you’re not likely to make it. What the penguins don’t mention is why Mumble, though a full-grown penguin, still has the cute, downy gray and white baby fur. All of the other penguins in the film who have not just recently been hatched have the normal black and white with just little slips of blue and orange. However, the penguins don’t seem concerned with his stunted growth. They are just upset when he wants to dance when the rest of them like to sing. Which brings us to the music. It is fine and done well, but… I just don’t like it when movies try to shoehorn popular songs in completely inappropriate settings. I didn’t like it when they used Nirvana and Elton John in Moulin Rouge or Queen and AC/DC in A Knight’s Tale or The Cure and New Order in Marie Antoinette and I don’t like it here. I kept watching wondering how all these singing penguins who had never left Antarctica had become so familiar with the songbooks of Prince, Elvis Presley, The Beatles, Earth Wind & Fire, Queen, The Beach Boys, et al. It pulls you out of the fantasy world the movie is creating every single time. Copyright ©2006 PopEntertainment.com. All rights reserved. Posted: November 24, 2006. Tags: Anthony LaPaglia, Brittany Murphy, Carlos Alazraqui, Chrissie Hynde, E.G. Daily, Earth Wind & Fire, Elijah Wood, elvis presley, Fat Joe, George Miller, Happy Feet, Hugh Jackman, hugo weaving, Jay S. Jacobs, Jeff Garcia, John Collee, Johnny A. Sanchez, Judy Morris, Larry Moss, Lombardo Boyar, movie review, Nicole Kidman, Peter Carroll, PopEntertainment.com, prince, Queen, robin williams, Roger Rose, Steve Irwin, The Beach Boys, the beatles, Warren Coleman. Bookmark the permalink.